MP2 will meet your needs. printer to an RFID printer, SL5000r MP2, in the field for an easy transition to RFID when needed. Why choose a Printronix thermal printer? Printronix System Architecture (® 2) allows sharing of applications across all Printronix technologies seamlessly, satisfying both present and future printing requirements. From the industrial printer company that introduced the most durable and respected line matrix printer over 25 years ago, now comes the Printronix T5000e, an industrial grade thermal bar code printer designed for high print quality and reliable operation. The T5000e is the perfect solution for the supply chain of industrial companies and distribution centers. It offers a wide range of features designed to make batch or on-demand bar code printing both human-readable and computer-readable. What places the T5000e thermal printers a step above the competition? These printers, as well as the Printronix laser and line matrix printers, have two exclusive features?Printronix System Architecture (PSA) and > PrintNet Enterprise. PSA enables the three Printronix print technologies to run the same application software. PrintNet Plus, the Printronix network management system, allows users to manage Printronix printers worldwide from the network administrator's desktop. The Printronix T5000e Series is the only thermal printer designed specifically for the supply chain of today?and tomorrow. Unsurpassed web-based networking, combined with the industry�s only closed loop bar code quality control system, provide true best-in-class functionality. The Printronix T5000e is a rarity: a printer that makes your whole system function better, more efficiently, and more accurately. PrintNet Enterprise allows remote management and control of printers quickly and easily. By installing the PrintNet Network Interface Card (NIC) into your T5000e and adding the Java-based Printronix Printer Management Software to your network, you can completely manage the configuration and operation of a single printer or a whole network of T5000e printers worldwide from any PC desktop. It is the ONLY truly global network management system for thermal printing. Online Data Validation features read-after-print technology that carefully analyzes every printed bar code to assure that it meets stringent compliance standards. This closed-loop bar code quality control system eliminates failures, which could translate into a rejected item, the need for manual correction, productivity delays or heavy fines. It even reprints faulty labels. The result? ?Increased system efficiency. 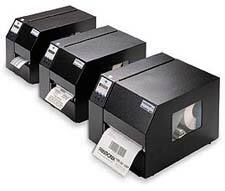 The Printronix T4204 is the only mid range thermal printer equipped with web-based networking capability. Durable and dependable, it sets the standard for true user friendliness in supply chain applications. PrintNet Enterprise allows remotely management and control of printers quickly and easily on any network platform, including Windows, Unix, and Linux. Application support for all platforms, including Codesoft and LabelView from Teklynx, International (Windows), Label Matrix from Strandware (Windows), Barcode 400 from T.L. Ashford (AS/400), and Barcode 2000 from Unibar (Unix). Starter software demo package includes label design programs for Windows, AS/400, and Unix. Complete selection of resident bar codes ?including 2D Maxicode and PDF 417.